Welcome along on our trip to Sakakah, January 13, 1975. 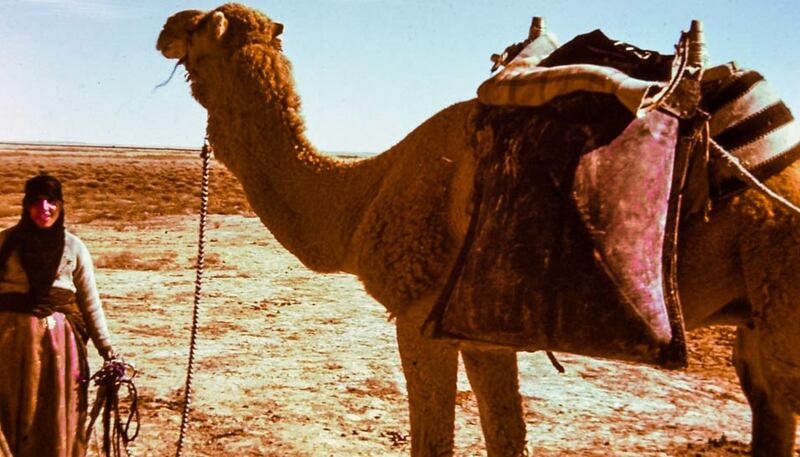 I was asked to drive several Aramco women to Sakakah, capital of the al-Jowf area, for the Annual Camel Race. We drove in a vehicle owned by Ann Rhea. Ann was interested in observing local culture. I was the media specialist for the Aramco Schools. The Superintendent gave me permission to make the trip and photograph the events for the school. Aramco has a series of pumping stations with employee communities along the road that follows the old pipeline going north along the Iraqi border. The pipe used to carry oil through Saudi Arabia, Jordan, Syria and Lebanon to the Mediterranean loading port of Sidon. The pipeline was shut down due to unrest in the Middle East but the communities remained open with medical facilities and schools for employee children. 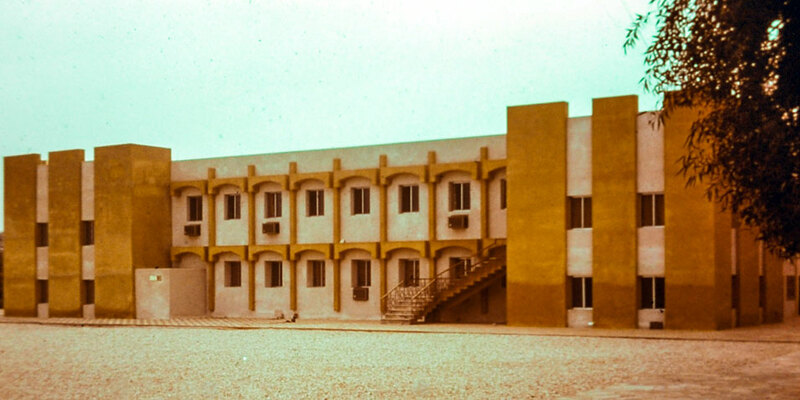 Aramco maintained guesthouses and all Aramco employees could book rooms and eat in their dining halls. We stayed in a guesthouse on our way north. After two days of driving north on the Tapline Road to Badanah, we turned west and followed a new road that was under construction. It was mostly a bad dirt road at that time. Along the way, we stopped at a waterhole that looked like a small lake. 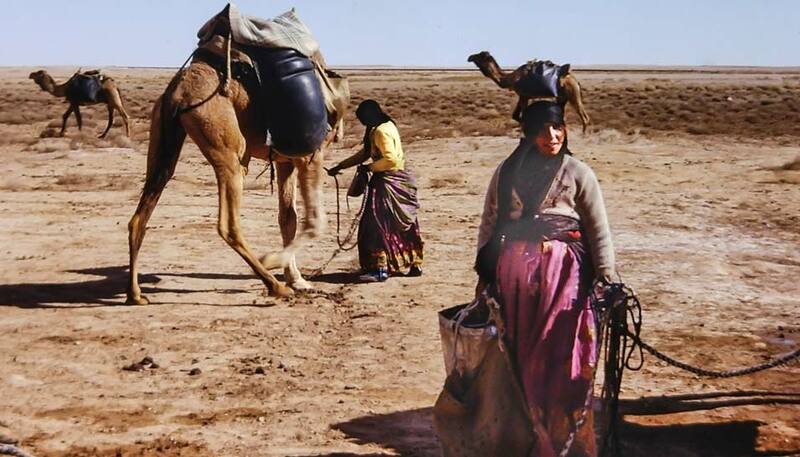 A Bedouin woman and a couple of camels were nearby collecting water in rubber bags that hung from the camels. 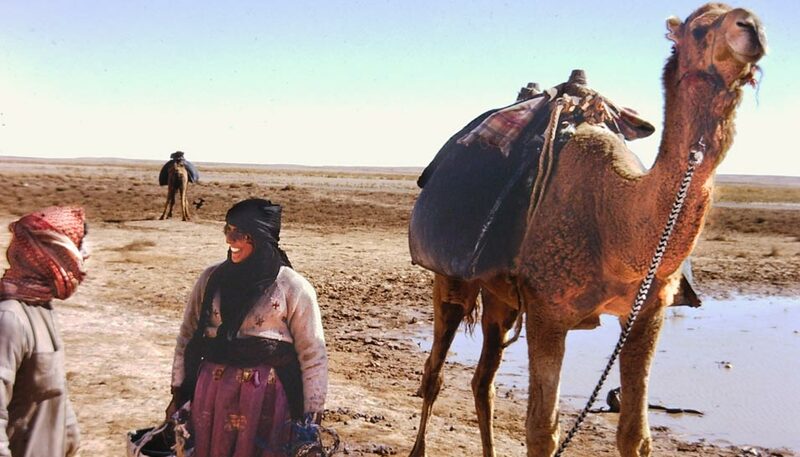 Women place rubber bags on the backs of four camels. 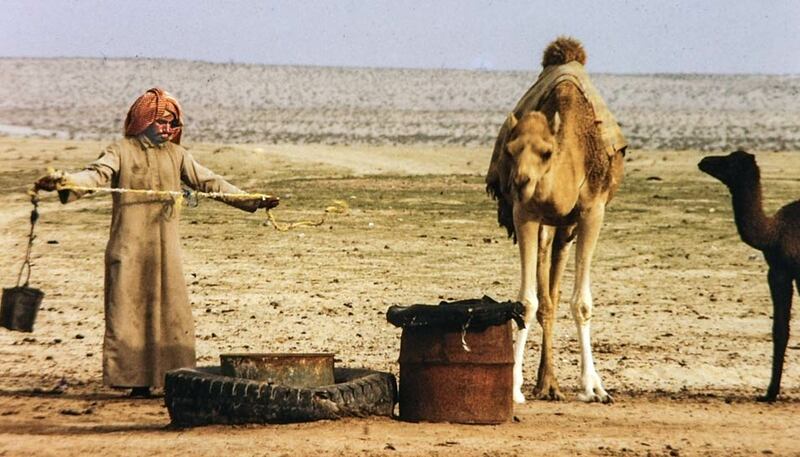 Bedouin man getting water from a desert well for his camels. 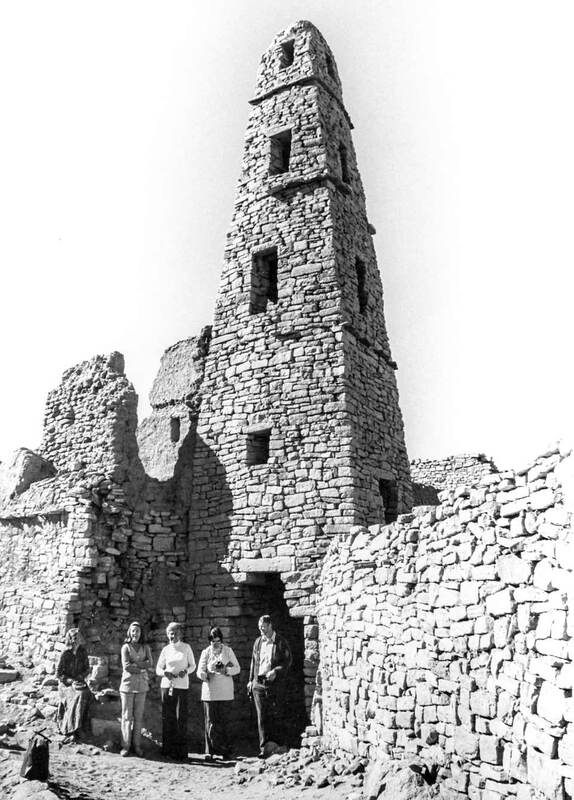 Our attention is drawn to the high fortress, which we are anxious to explore but first, we must pay our respects to Emir Abd ar-Rahman as-Sudayri who invited us to be his guests. He graciously opened his new guesthouse to us. 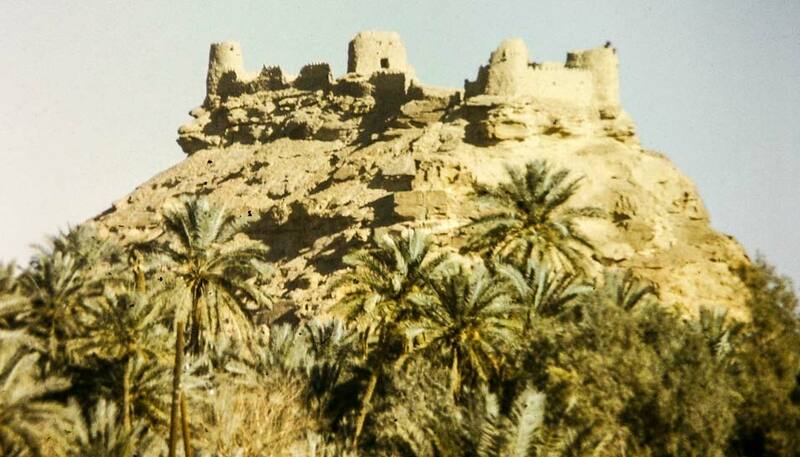 Omar Mosque within Qasr Marid at Dumah al-Jandal. The photographer is Khalil Abou El-Nasr (Aramco Tapline photographer). The Aramco people in front are: Ann Rhea, unknown, Lois Taylor, Emily Aberli and Ted Seymour.